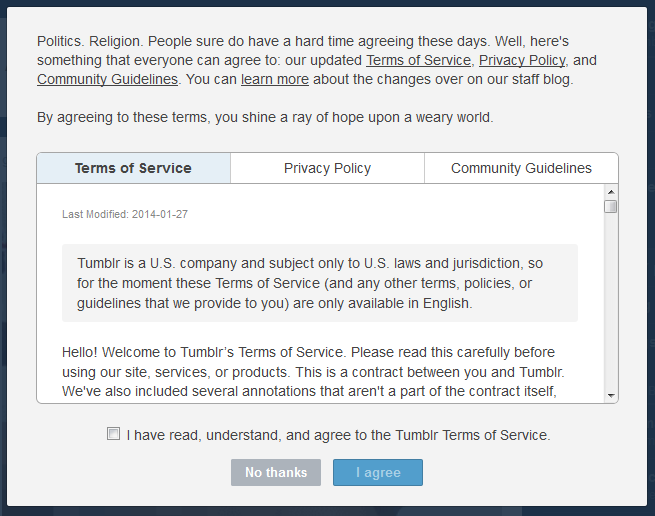 As of today (Jan,28 2014) you log into your tumblr dashboard and you are welcome with a "new Terms and conditions (ToC)" popup with a long list of legal updates - and also it was expected since Yahoo acquisition, this might be a bad omen for tumblr users. Although most tumblr audience first reaction are positive, while they're having fun reading the new TOC because it seems hilarious in many ways - it's not the point - many users already have noticed image removal in their old posts with a laconic message : "This image has been removed for violating one or more of Tumblr’s Community Guidelines." And while we can understand tumblr.com is expanding and trying to keep his viewer safe of seeing NSFW material "accidentally"- this is ironically coming at the period of time where freedom of speech and internet neutrality are endangered. So what is the alternative, if you don't want to click "agree"? A nice alternative to closing your tumblr account and stop tumbling, is to jump ship and start on another platform - which looks like tumblr 2 or 3 years ago (even with the occasional crashes). Introducing soup.io a tumblelog very similar to tumblr - but still young and fresh and with a Term and services in German only and on one page only! 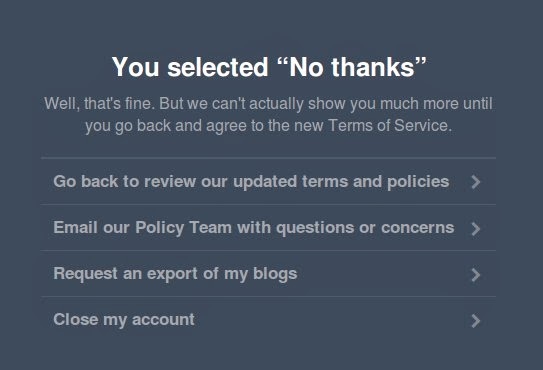 Simply go into "option" and "Automatic imports" (see below) you select tumblr and put your tumblr name and press "add" - and this will just transfer the content of your tumblr. 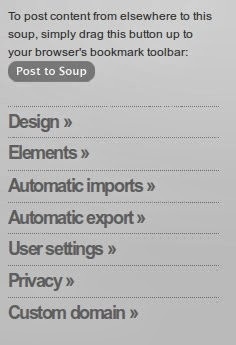 Basically soup.io design are a lot simpler - and his active community is currently around 40,000 (*) users (compared to estimated 30-50 millions active users for tumblr).